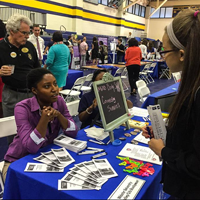 The 2016 Webster Wellness & Student Success Fair was a huge success. Thank you to our 37 vendors who participated and approximately 250 attendees who came. We hope that the Wellness Infusion theme supported your wellness needs and desires spiritually, emotionally, intellectually, physically, socially, environmentally and financially. The goal of the Fair was to encourage attendees to make positive life-style changes that help improve your overall health and well-being. On behalf of Webster Wellness and First-Year Experience, thank you for attending and see you next year. View more photos at the University's Facebook page. The flu shot vaccination provided by Walmart Pharmacy on Sept. 16 administered 70 flu shots for staff, faculty and students.